You can choose not only the placement that will suit your body but also the jewellery art that has the best chance that you'll like it. Remember, piercing in real world is not a game, it will stay on your skin forever, so first check how it looks on our application. 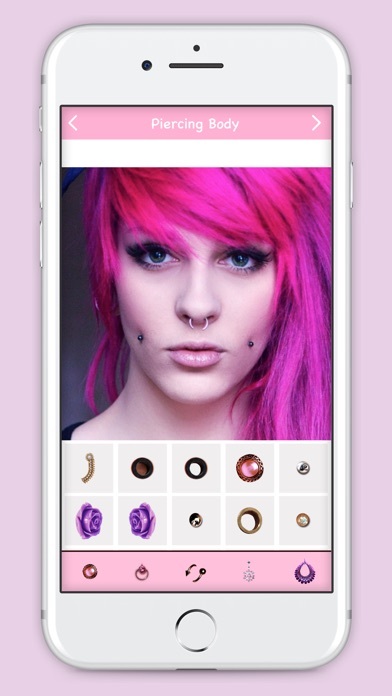 Piercings Photo Editor is a photo editor application to create a nice piercing tattoo and also looks like real. Piercing On Body Features : - There is a collection of piercing body and tattoo that is easy to use. - piercing can be enlarged or reduced easily. - piercing can be rotated at will you. - Choose your favorite piercing and put it on your nose, ear, mouth, navel. - Piercing is a form of body modification which people use to express their individuality. Want beautiful Body Piercing, Piercing tongue, lips or any face - and body also make prank photo to show mom but don't want to pain.